I don't know about you but I'm so ready for Spring!! Mother Nature teased us last weekend with some Springy weather and then we got snow Monday night through Tuesday morning. My day lilies are starting to pop up and my rose bushes are getting some new growth on them. I really can't wait for all of my flowers to pop up! 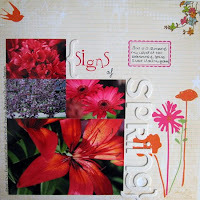 I did a layout for Serendipity Scrapbooks DT with my flowers from last year. 1. Apply rub-ons to background. Apply glitter. 2. Group photos on left side as desired. 3. Use rub-ons and cardstock letters to make title. Wrap title around photo grouping. 4. Journal around photo grouping. 5. Stamp a journaling stamp or frame stamp and finish out journaling. Hope you like it!! Don't forget the time change Sunday morning!!! just LOVE all the flower photos and I am sooo ready for spring to start!! !